On a summer day on North Haven Island in Maine, Frederick Warren Allen was rowing the family dinghy in Bartlett’s Harbor in front of their cottage with his son, also named Frederick. As the twosome peered over the side of the boat into the water, father Allen spotted a large granite boulder. “There is an elephant,” he told his son. “Let’s get it into the boat.” (Elizabeth Smith) That story is one of the two remembered about this beloved Elephant. The other is that after having seen it beneath the water in the harbor, he kept rowing over it until he could no longer resist it and had it pulled up in the way the islanders would move the heavy weight for a boat mooring. (see Memories of North Haven, Childhood Summers in Maine by Barbara A. Benton) As his granddaughter remembers it, he said, “It was already an elephant. I just finished it off.” Whatever the true story, it was a granite boulder that had been shaped by the waves. 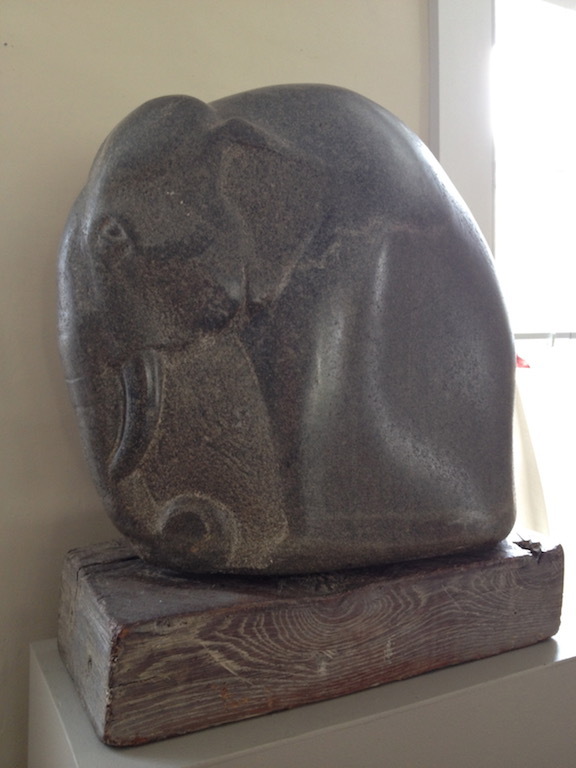 The artist saw an elephant in the shape and carved some details to create this magnificent and graceful animal. It was the carvings made directly from stone found along the North Haven shoreline, where some of the Boston School of Artists congregated, that became the works closest to Allen’s heart. 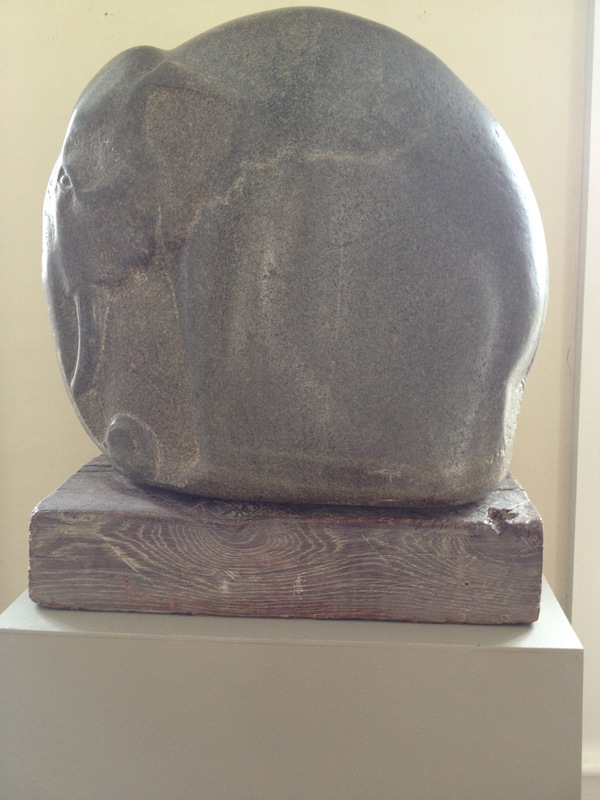 He chose granite stones in sizes from eight-inch “pebbles” to boulders and carved directly, working from his imagination only, developing and refining the work sometimes over a period of years. In the case of the Elephant, the shape was already there, “the height of the shoulders, the drop in the hindquarters, and the strong leg supports with a depression between. 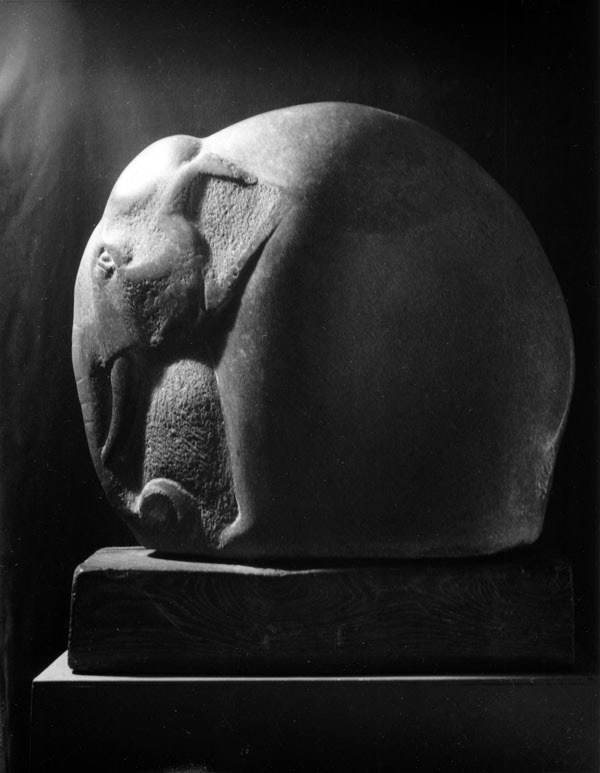 Even the skull and trunk were suggested.” (Elizabeth Smith) He gave detail to the head and trunk, polished the front legs and tusk, created textural contrast to indicate space or shadow and left the rest of the stone as nature had shaped it. There is movement in the form and a softness and vulnerability in the eye, making it come to life. “Endearing” and “powerful” are words used by Greenthal in American Figurative Sculpture. You instinctively stroke the head and smooth back as it invites you to come close and touch it. Two other details are also worth noting when one looks closely. The first remarkable illusion is that the way the light hits the legs it makes the elephant appear as if it is walking. The other detail, characteristic of his direct carving, is the way Allen used the natural lines within the stone in his composition. One vein remarkably follows the lower outline of the ear and continues onto the back, the other at the base looks as if she is walking on a path. The Elephant is the irresistible popular favorite, a gentle giant! 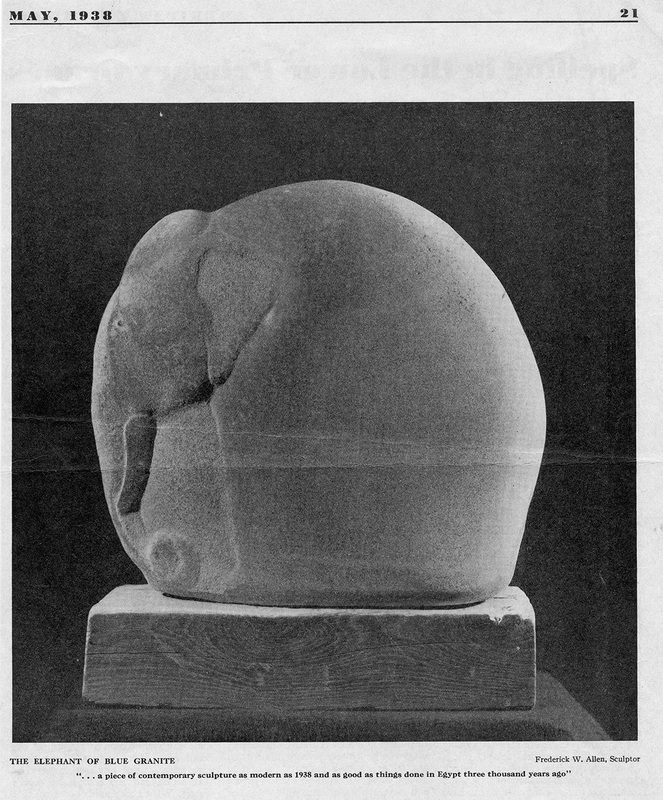 The Christian Science Monitor interestingly notes that “Frederick W. Allen has several interesting exhibits which reveal how engrossed he has become in abstract form, deliberately maintaining the geometric shape.” The Elephant is singled out for comment.